Poola Rangadu is a 1967 Tollywood film that is loosely based on A. J. Cronin's novel, Beyond This plce. 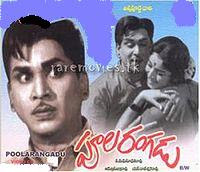 It was directed by Adurthi Subba Rao and stars ANR and Jamuna. It is a commercial hit film with some good songs.The film ran for more than 100 days in 11 centers in Andhra Pradesh.